William FIDLER was born in November of 1827 in St Francois Xavier (SFX), Manitoba, the son of Nancy BLACK & George FIDLER (1800-1846). He was a grandson of Mary MACKAGONNE (Cree) and Peter FIDLER of Bolsover (1769-1822), surveyor, explorer and trader for the Hudson’s Bay Company (HBC). In 1846 William was 19 years old when his father (George) died in SFX, leaving his mother a widow with five children at home. Frank’s only sister (Marie) was married at that time to Charles PELLETIER and had four children of her own. William, now the family elder, must have had to assume the role of bread-winner. His younger brother (Antoine) was only 14 and his other siblings were Frank (age 8), Joseph (age 6) and George (age 5). Trapping for furs, hunting, fishing and farming provided a livelihood for most of the residents of the White Horse Plains at that time, and almost every able bodied man in the community participated in the annual buffalo hunt. Immigrant settlers moving west from Winnipeg were finding the land around SFX agreeable for homesteading, and in 1850, Sisters LAGRAVE and LAFRANCE founded a convent in the area. The two sisters had previously founded the Grey Nuns convent in St. Boniface, and were the first sisters in SFX. The convent also served as a school for local Métis and native children, housing approximately 25 students in its early days. On May 20, 1851 William married in SFX to Marguerite McGILLIS. Marguerite was 20 years old, a daughter of Marguerite (nee BOTTINEAU) and Alexander McGILLIS (1798-1889), a descendant of Scottish immigrants who settled in America back in 1773. Marguerite was born and raised in SFX. She was a niece of Cuthbert GRANT JR (1793-1854). Her aunt (Marie McGILLIS) was Cuthbert’s wife. On June 15, 1851 almost every able bodied man from SFX departed for their annual spring buffalo hunt, most accompanied by their wives and children. William was 24 years old when the 1851 Battle of the Grand Coteau (between the Dakota Sioux and the Metis of SFX) took place in North Dakota. For more details about the battle, refer to George FIDLER. In 1875 both William and Marguerite (of SFX) claimed their Métis Scrip. On Feb 8, 1875 daughter Marguerite married in SFX to Paul DESJARLAIS. Around 1879 daughter Marie married Paul’s brother, Pierre DESJARLAIS. He died in 1880. Census 1881: SFX/Marquette: William FIDLER b-1832, age 49; Marguerite b-1835, age 46. Children: Marie 28; William 26; Cuthbert 24; John 22; Xavier 19; Alexander 16; James 15; Norbert 11. This is the only census in which Alexander appears. I believe this must have been the Alex who was a child of Caroline McGILLIS & William’s brother, ANTOINE FIDLER 1832 ** Both of Alex’s parents had died by 1872, and William had probably adopted him. In any case, Alex died in 1886. It is said that n 1882-83 twenty families from SFX moved to the Batoche area in Saskatchewan. William and his brother, Francois FIDLER, and their families were among them. They of course were descendants of George FIDLER (1800-1846). March 26, 1885: At Duck Lake a group of Metis under Gabriel DUMONT (and RIEL) encountered CROZIER’s combined force of Prince Albert Volunteers. Isidore DUMONT (Gabriel’s brother), his rifle held at rest across his saddle, and a Cree, ASSYWIN, unarmed and carrying a white flag, rode slowly down the road. They obviously wished to speak to CROZIER who, with “Gentleman” Joe McKAY beside him, rode out to parley. DUMONT only had time to say, “Is it to be war?” McKAY must have had his rifle pointing at ASSYWIN who reached out and turned the rife to point in another direction. 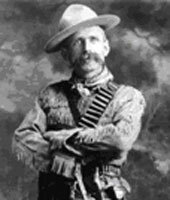 On seeing the unarmed man grab at the barrel of the rifle, CROZIER said to “Gentleman” Joe, “Shoot him.” McKAY quickly drew his revolver from his belt and shot ASSYWIN. Then, turning slightly, “Gentleman” Joe shot Isidore DUMONT through the head. These were the first shots of the Metis uprising of 1885. In the battle that ensued, the Metis also lost Jean Baptiste MONTOUR, Joseph MONTOUR and August LAFRAMBOISE. CROZIER lost 10 men, 13 wounded (2 which were fatal). CROZIER and his men retreated to Fort Carlton, which they soon hastily abandoned for Prince Albert, where they sat out the remainder of the conflict. RIEL and DUMONT returned to Batoche to prepare the settlement for a much greater battle that was sure to come. William FIDLER and his entire family were probably living south of Batoche along Fish Creek when the hostilities began. His brother, Francois FIDLER (1838-1893) appears to have been living north of Batoche. Jules MORIN was told that his great-grandparents, Veronique (nee GERVAIS) & Jean Baptiste FIDLER b-1859 (Francois’ son) participated in the resistance, and that Baptiste was one of the younger participants (he would have been about 26 years old then). 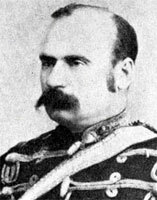 On March 28 Major General Frederick MIDDLETON, commander of the British troops in Canada, arrived at Qu’Appelle with about 8, 000 soldiers. There he divided his forces into three columns. The main striking force was commanded by himself, and his coloumn was to approach Batoche from the east. By April 3 his troops were at Humboldt. The Battle at Fish Creek was MIDDLETON’s first encounter with the Métis. 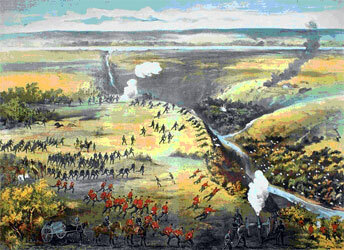 On April 23 he moved his newly divided forces from Clarke’s Crossing, which was only a few days march away from Batoche. That night Gabriel DUMONT’s scouts told him that the Canadian troops were camped at the McINTOSH Farm, which was about ten km south of Fish Creek. He prepared an ambush at Tourond's Crossing. The battle ended with a major victory for the Metis and effectively delayed MIDDLETON’s advance to Batoche by two weeks. The Battle at Cut Knife Hill occured on May 2, about a month after The Frog Lake Massacre. These events mostly affected the settlers at Bresaylor. See JAMES BREMNER for more details. I need not go into detail about the actual events that took place in this final epic battle by the Métis. There are endless versions of it on the Web and in books. Our main interest here is the involvement of our FIDLER cousins. 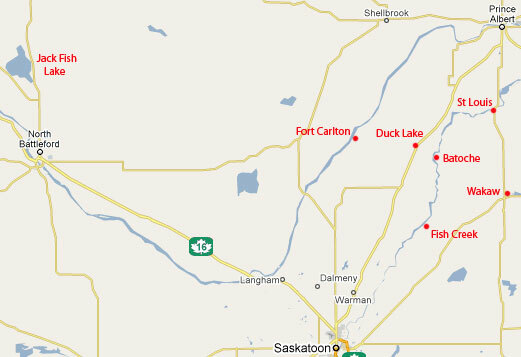 During the rebellion we know there were numerous FIDLER descendants living at various points along the South Saskatchewan all the way from Bresaylor to Prince Albert. I have done exhaustive searches to find the FIDLER name in association with the events, but my results have been disappointingly few. It is difficult to pinpoint the actual location of William’s family in 1885, but he appears to have been living in the Fish Creek area at the time. The Regina Leader, May 19, 1885: Batoche, 13th, -- via Clarke’s Crossing. Several wounded Breeds brought into camp, amongst them being Councillors DELORME, and JODIN, former likely to die, latter shot in thigh; number of prisoners taken most important, being Eneas POITRAS, William FIDDLER, Alexis GERVAIS, Francis and Patrice FOURAND, Maxime DUBOISE, Albert MONKMAN and the JACKSON Brothers. They will be held for trial, majority having been RIEL’s councilors. Actual rebel loss unknown, but forty-two bodies found on field already, fifteen of which are Indians, and over twenty known to be wounded. After the Rebellion, many Métis homes were destroyed and many of the families relocated soon after. Only after Scrip and Land Grants were issued does it become possible to more accurately locate people. In the Census of 1891 for Batoche & Duck Lake Census District (probably Fish Creek) we find William (age 63) and Marguerite (age 58) with three of their children (Xavier, James and Norbert), all in their twenties. William's entire family were neighbours at this time, including his two daughters (Marie, now BELLEGARDE) and Marguerite (now DESJARLAIS). William died on Oct 27, 1895 at Batoche, and in Census 1901 we find Widow Marguerite (age 70) living alone in Fish Creek. Her son Xavier (age 40) is her neighbour.